In a Twitter exchange with John D. Cook, John mentioned to me that he "heard it said we live in a golden age of engineering and a dark age of science". That really got me thinking: do we live in a golden age of engineering and a dark age of science? I've spent some time pondering similar questions on this blog, but I suspect my thinking has changed recently. On the affirmative, Moore's law has been in steady operation for fifty years. Computers really do keep getting smaller, faster, and cheaper. I can do things as an engineer that my predecessors would find fantastical. I can design an object using that cheaper computer, and have it 3-D printed in a week or less. Lots of people have heard of 3-D printing with plastic, but I do it with metal. Not only is the field of engineering more capable, it tackles bigger goals now. I work as a manufacturing engineer. I'm not only expected to make a product that works; it needs to keep the customers safe, and the people who work for me making it. I need to make sure the medical device I design is bio-compatible. I need to make sure handle of the device is comfortable in the surgeon's hands. I need to make sure the manufacturing process is ergonomically friendly to the expected variation in human body sizes. And you still need to make money. The body of knowledge I have to integrate is way more complicated than that contemplated by any Victorian engineer. I need the assistance of many more domain experts who have studied these things and turned them into bodies of knowledge that deserve to be called science. On the negative, we haven't been to the moon in forty years. Granted, we don't spend that kind of money on science [engineering] projects anymore. In inflation-adjusted dollars, a moon mission launch alone cost $2.7 billion, and the whole project adjusted for inflation was $170 billion. We spent about $2.7 billion on the Human Genome Project, and that was considered a little steep at the time. As for technology, we lack the flying cars and interplanetary travel that have been staples of science fiction for nearly 100 years. It is not uncommon to see the claim that either technological or scientific progress has slowed in the twentieth and twenty-first centuries. Scott Locklin posted a typical example on Taki's Mag in 2009, The Myth of Technological Progress. John Horgan posted a slightly different take just this week on Scientific American, focusing mostly on the poor quality of some contemporary research papers. Bruce Charlton went the furthest, claiming that intelligence in the West has declined over the last 125 years or so. Ultimately, I don't really believe that technological or scientific or intellectual activity has markedly slowed. I do believe we are interested in different things than we used to be interested in. Science has turned inward, and produces more and more technical work with a narrower audience. Engineering, which is really part of the world of business, produces some science, but modern business is fiercely focused on the bottom line, typically with a very short time horizon. I have posited a cocktail party theory that science suffers from a lack of experience with practical problems. I suspect there is a synergy between engineering and science that made the scientific revolution possible. Ancient Greek science and modern science are both pretty good, and focus on understanding things for their own sake. However, that explosion of mental activity we now call the scientific revolution came about because science turned from knowledge for its own sake to useful knowledge that allows us to bend nature to our will. We now seem to be turning back to knowledge for its own sake. As an Aristotelian myself, I can't really fault this. However, it probably means that what scientists think of as an interesting problem and what the rest of society sees as an interesting problem will diverge. Ultimately, this probably means that the golden age of engineering will end too, because mental effort will be focused elsewhere. That is a little more true than most people like to think. It is useful for me to have studied algebra, but I don't often need to directly apply the skills you learn in algebra class. Almost every kid — and I mean virtually every kid — can learn math at a very high level, to the point where they could do university level math courses,” explains John Mighton, the founder of Jump Math, a nonprofit organization whose curriculum is in use in classrooms serving 65,000 children from grades one through eight, and by 20,000 children at home. “If you ask why that’s not happening, it’s because very early in school many kids get the idea that they’re not in the smart group, especially in math. We kind of force a choice on them: to decide that either they’re dumb or math is dumb. What is the revolutionary method? : go slower, break it down into simpler steps, and use less abstraction for the poorer students. At least based on the data in the article, it seems to work pretty well, but I would have expected it to. This new method is really the old method, dressed up in modern language. Hypocrisy in a good cause indeed. Steve Hsu links to a paper by Judea Pearl on Bayesian statistics and causality. 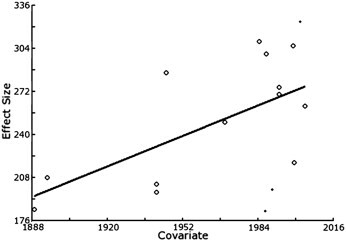 Judea Pearl: I turned Bayesian in 1971, as soon as I began reading Savage’s monograph The Foundations of Statistical Inference [Savage, 1962]. The arguments were unassailable: (i) It is plain silly to ignore what we know, (ii) It is natural and useful to cast what we know in the language of probabilities, and (iii) If our subjective probabilities are erroneous, their impact will get washed out in due time, as the number of observations increases. In that sense, I'm half-Bayesian as well. Coming at this from the direction of Thomist philosophy, I also do not regard probability as primary, but rather reality. One thing I might say differently is that the first things you know are mud and rain, and then you build a relationship between them with your mind [the third operation of the intellect]. More videos for the curious. I added Steve to the blogroll. Geoff Canyon has a post about Google's tricky interview questions. Microsoft is also known for asking these kind of questions during interviews, and you can run into them anywhere in the technical world. Also known as Fermi problems or back-of-the-envelope calculations, I ran into these a lot during college because physicists love these things. The idea is to increase your willingness to come up with creative solutions, and get over the panic induced by asking a question that has no easy answer. These are in fact a very sneaky kind of IQ test. I thought it would be fun and instructive [for me] to simulate my way to this answer rather than do it analytically. This problem can be solved analytically, but not all problems can, so sometimes it is good to know how to do this. 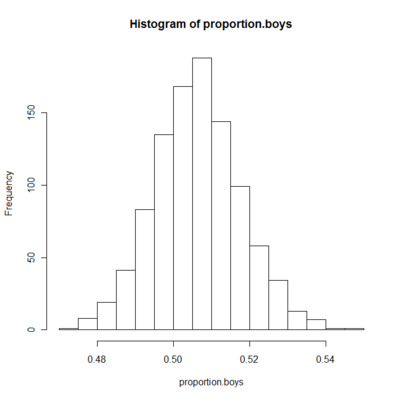 I actually set the probability of a boy being born to 0.514, since 106 boys are born for every 100 girls or so. The mean of the data turned out to be 0.504 with a standard deviation of 0.011, which is close enough.